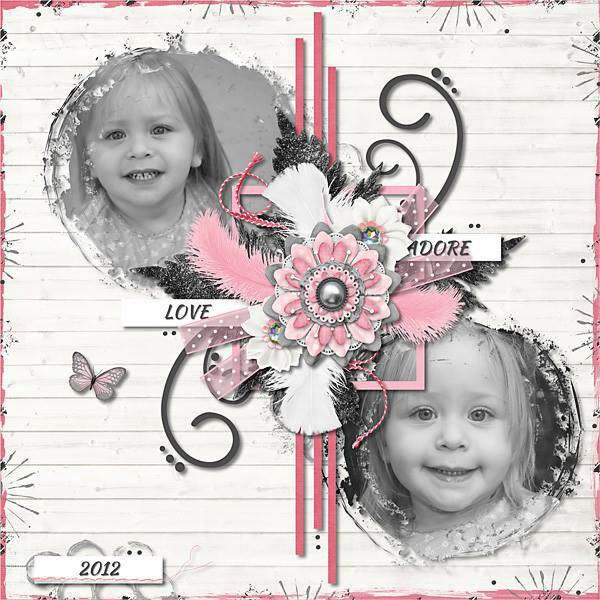 I've got yet another blog packed full of gorgeous inspiration with our newest templates from my totally awesome Creative Team, a few new releases from some of my favourite designers, a great freebie and my two pages from the third round of the Layout Artist competition at the Digital Scrapbooking Studio. 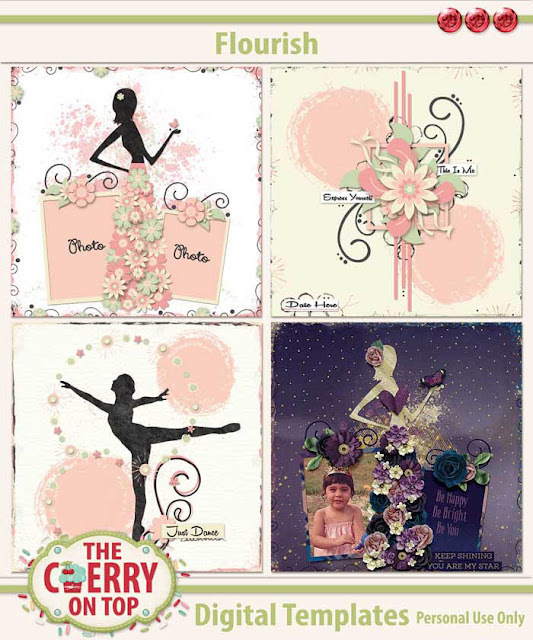 Dive into today's creative crazy blog! How'z about those new templates, huh? Pretty amazing and different, right? I layered like crazy when it came to those edges and scatter and splatter. Pain stakingly detailed so you don't have to do all of the work. It's been done for you! 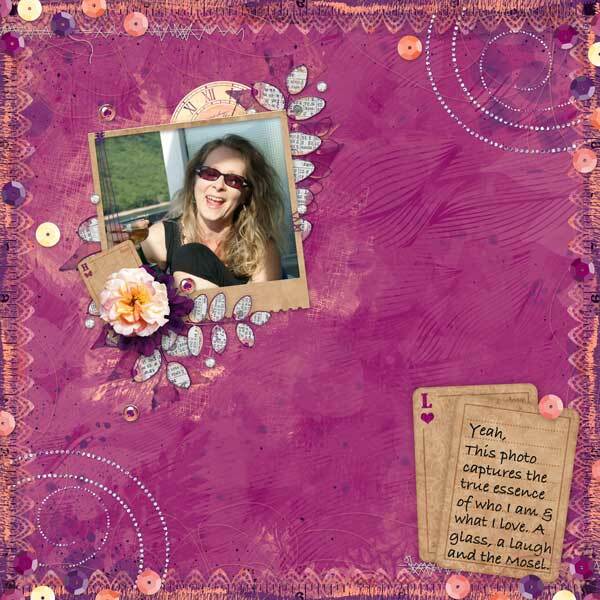 I scrapped all of these templates, as you will see further down the blog and I was so pleased how easy and fast my pages were scrapped. That is the point of templates, in my mind at least, yet sometimes I can take forever to scrap a page with templates, but not these. 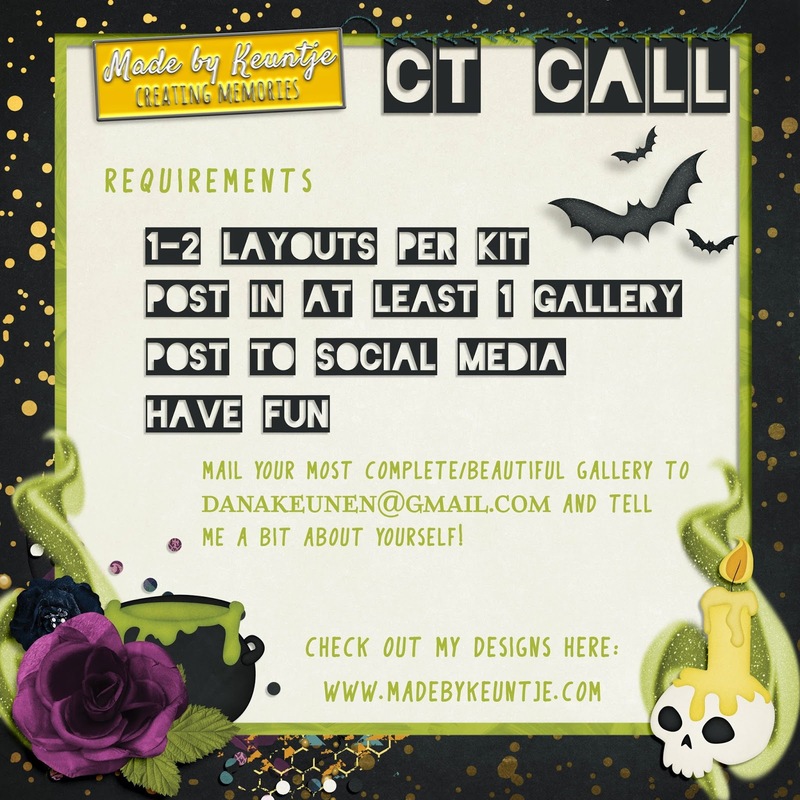 You've got to give them a try and see just how gorgeous your pages are going to be! Is Dana's page not mega fab?! It is exactly what I thought a page with this template should like. Smashing!!! 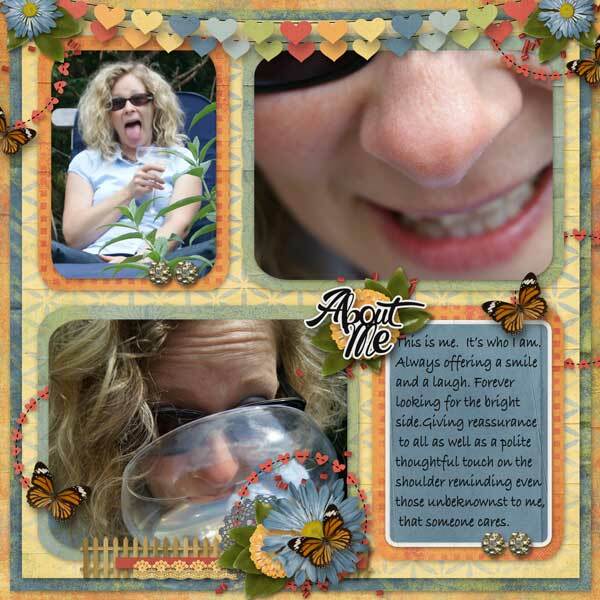 Laureen is new to our team and she's also played with all of the templates. Look at her pretty page. 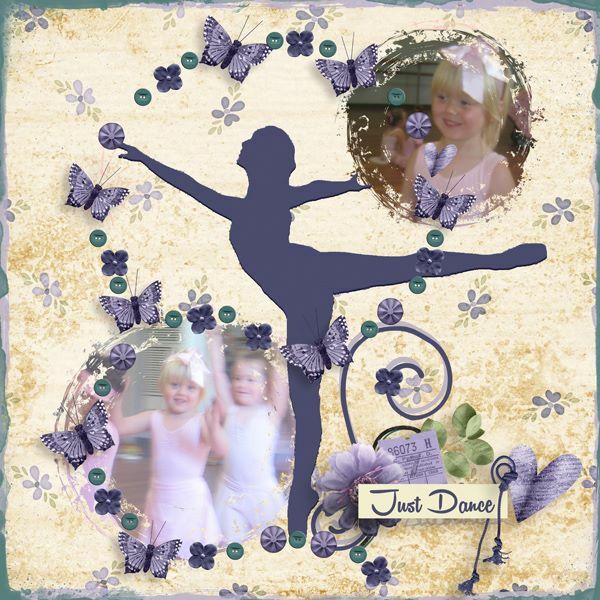 This is another page from Laureen. I love that carousel element. 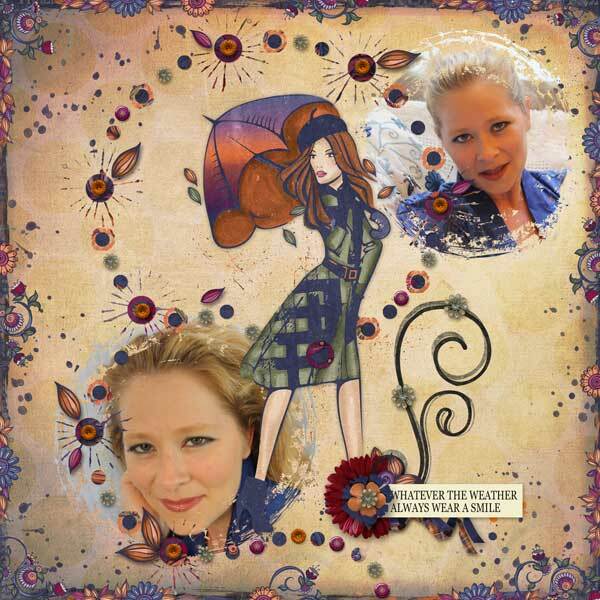 How about this fabulous page, also from Laureen. Just wow! 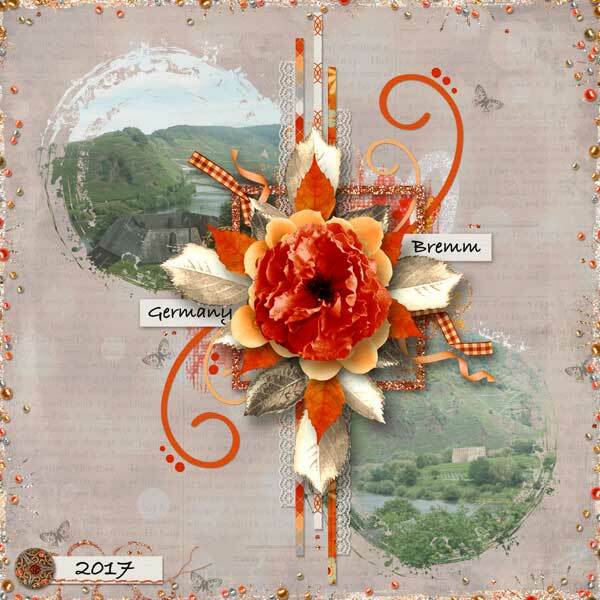 How about the splendid clustering Michal did on this fantastic page. You don't have to use the silhouette provided. They are supposed to be a guide. They are there to give you an idea of what kind of element would look good in that place. 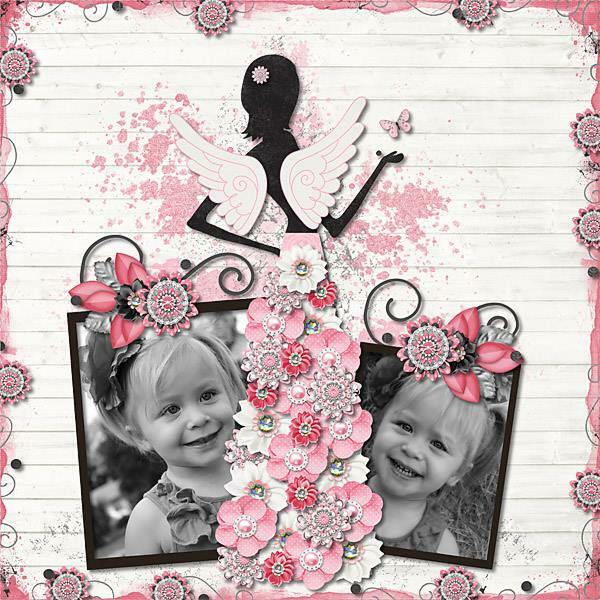 Rachelle also provides you with a double layout using templates #2 and #3. I'll be selling these separately in the shop due to their uniqueness. 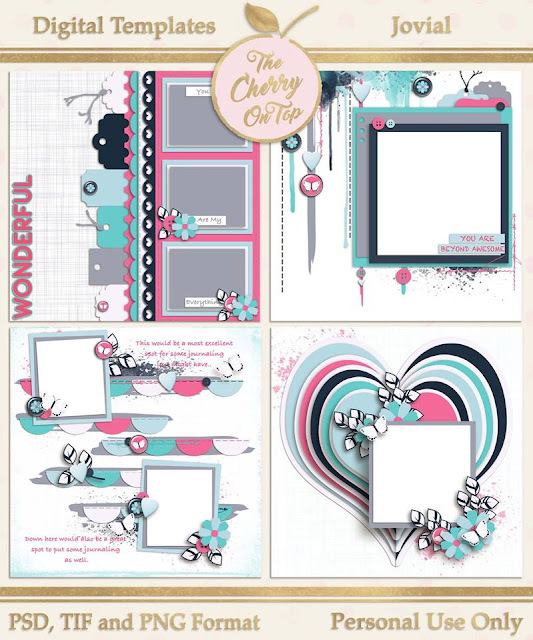 My gal Robyn from Scrapbook Crazy Creations by Robyn stepped in to help produce a couple of pages with her own scrapbooking products. Her pages are pretty darn fabulous, too! 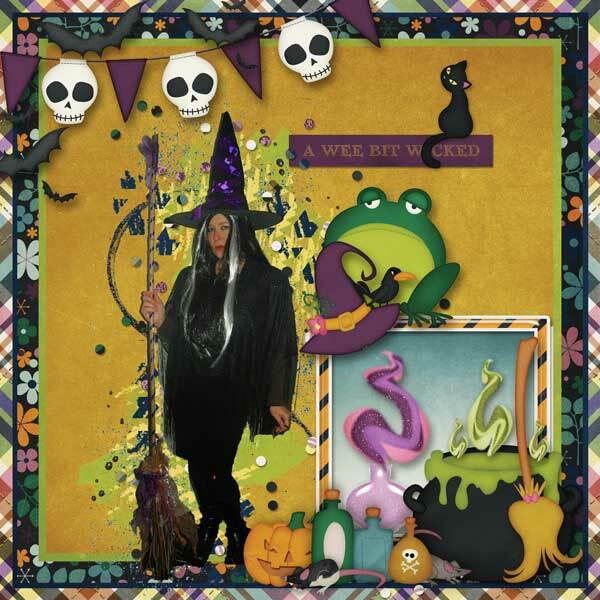 I just love how Robyn made my silhouette witchy! What a great idea! If you are tiring from fall colours, this springy page will perk you up. So soft and pretty, from Rochelle. 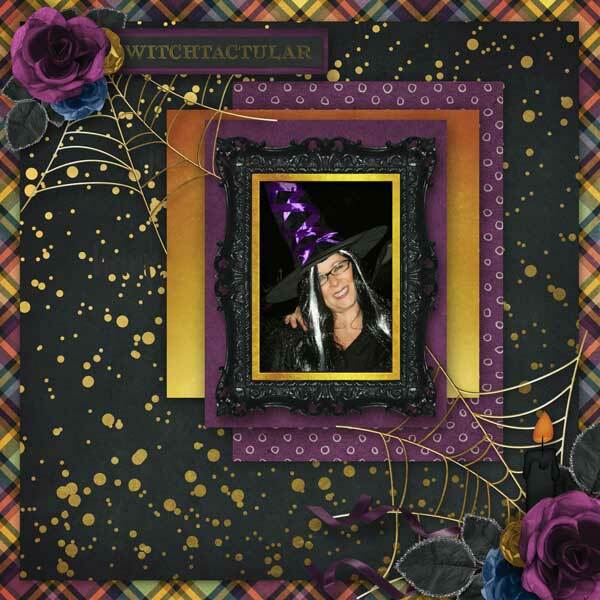 This is my page using Made By Keuntje's new kit, Witch's Brew. So my kind of kit! 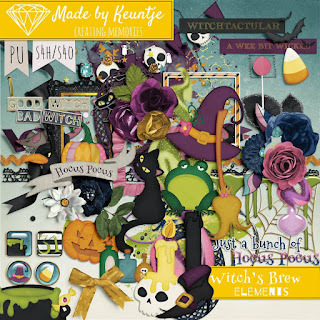 Black kitties, lots o' purple, glamorous gold and so many fun, hand drawn characters. I really, really love those. 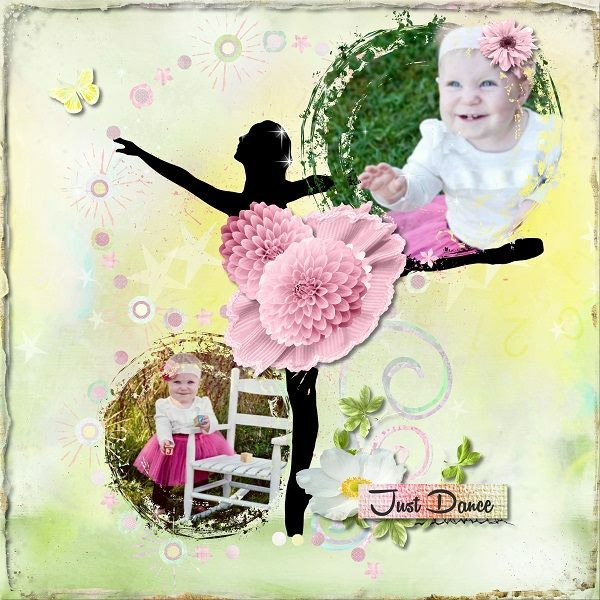 You'll see the inspiration in today's freebie from this page. 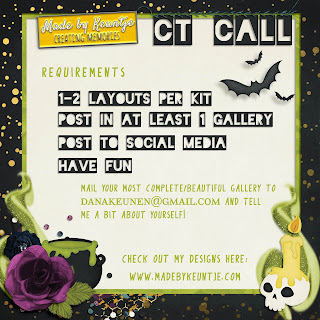 Dana is also having a CT call if you are interested. Here is today's freebie made by me and sponsored by Made By Keuntje. What a super kit! 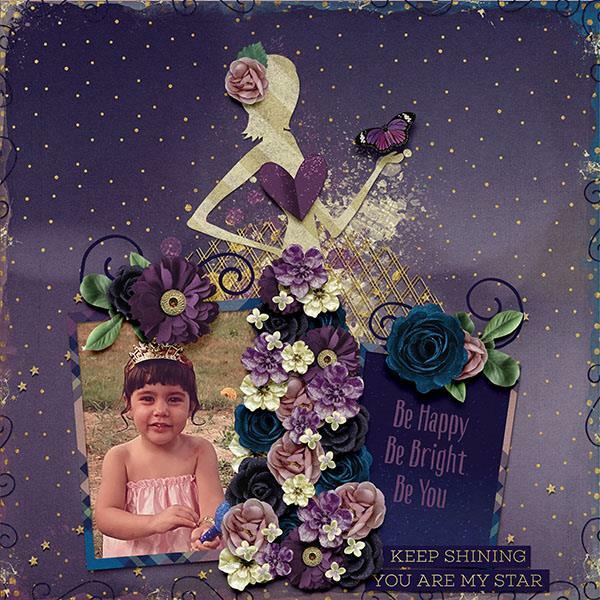 I've been sharing my page entries in the Digital Scrapbooking Studio's Layout Artist competition. 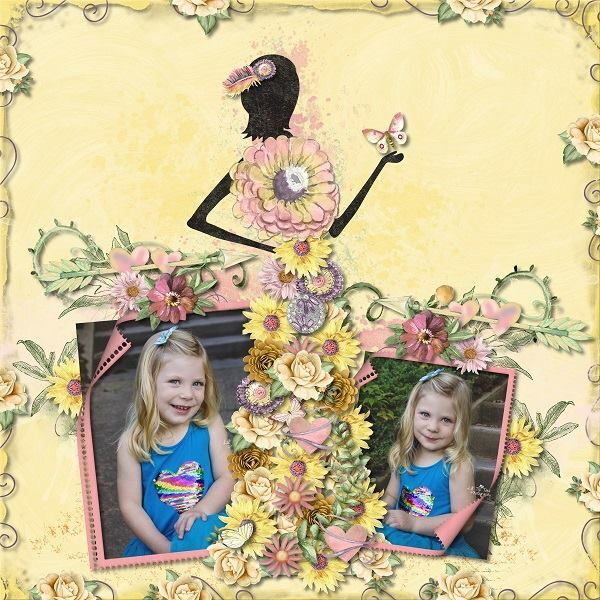 This is for the traditional category for round #3 and it's Aimee Harrison's Collection, Celebration of You. Go vote for your favourite or do the play along at the Studio. This is my artistic page for round #3. Didn't think I'd make it to round #2 so I'm really, really thrilled to still be in this competition. It's been making me scrap better and try things I wouldn't normally do and I get to use some designers goodies I've never scrapped with. Tomorrow, I'll be back with a rather extensive Halloween recap. 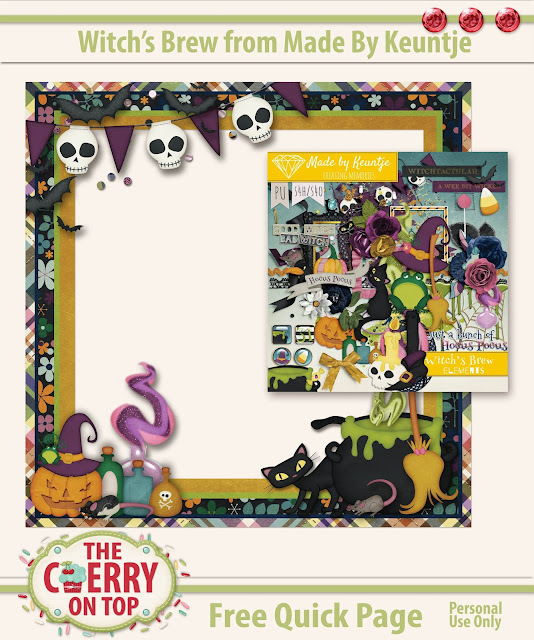 I'll share any links that are still live of our previous, free Halloween printables as well as our blogs featuring Halloween in case you are needing inspiration. Needing more freebies? Follow our page on Facebook where we share free stuff nearly every single day or our Pinterest Boards featuring all kinds of free goodies. Thank you so, so much for checking out The Cherry. I hope you take a pop in our shop and check out our goodies. Support The Cherry so we can keep bringing you all of this luscious scrappy goodness.